Type IA topoisomerase activities are essential for resolving DNA topological barriers via an enzyme-mediated transient single strand DNA break. Accumulation of topoisomerase DNA cleavage product can lead to cell death or genomic rearrangement. Many antibacterial and anticancer drugs act as topoisomerase poison inhibitors that form stabilized ternary complexes with the topoisomerase covalent intermediate, so it is desirable to identify such inhibitors for type IA topoisomerases. Here we report that organomercury compounds were identified during a fluorescence based screening of the NIH diversity set of small molecules for topoisomerase inhibitors that can increase the DNA cleavage product of Yersinia pestis topoisomerase I. Inhibition of relaxation activity and accumulation of DNA cleavage product were confirmed for these organomercury compounds in gel based assays of Escherichia coli topoisomerase I. Hg(II), but not As(III), could also target the cysteines that form the multiple Zn(II) binding tetra-cysteine motifs found in the C-terminal domains of these bacterial topoisomerase I for relaxation activity inhibition. Mycobacterium tuberculosis topoisomerase I activity is not sensitive to Hg(II) or the organomercury compounds due to the absence of the Zn(II) binding cysteines. 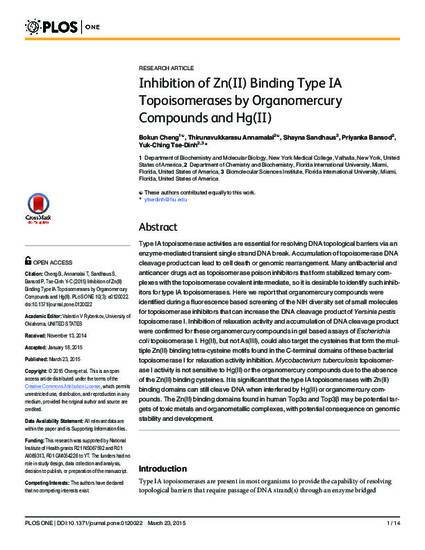 It is significant that the type IA topoisomerases with Zn(II) binding domains can still cleave DNA when interfered by Hg(II) or organomercury compounds. The Zn(II) binding domains found in human Top3α and Top3β may be potential targets of toxic metals and organometallic complexes, with potential consequence on genomic stability and development.